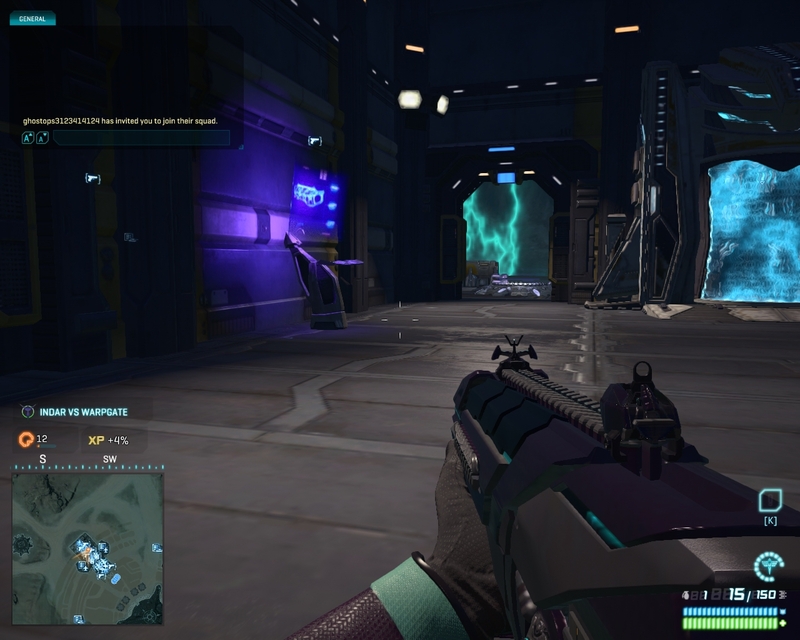 I loaded up Planetside 2. Why, you might ask ? It’s free, and I did get a code for a few thousand Station Cash for logging in one time. John Smedley pushed it himself in a Reddit AMA, and while this might be a BS transparent attempt to build up interest in his MMO, I also know from advanced age that sometimes a banana is just a banana, and the guy sounds very sincere and passionate about the game. I know next to nothing about the game otherwise, except that it is a massive shooter title, with some MMO elements, but much more based on player skill than it is a traditional fantasy MMO. The visuals, as usual, are very immersive. Every game out there is making beautiful graphics, this is apparently the easy part. However, I did not locate a list of commands and so took no screenshots. You start out by “jumping” into a hot spot of action on the planet where the very standard three factions are all duking it out for control. I have no idea what happened when I was dropped into the game. The lag was abysmal. I waited perhaps 20 seconds for the screen to update/shift. I think I was killed on the spawn, which mirror’s TAGN’s documented experience with the game. OK, then. Perhaps I am simply suffering from graphical lag. I reset the game down to medium graphics and log in again, and find myself wandering around the base for my faction. It’s very pretty. There are what looks like a bunch of terminals at various points, and strange glowing columns that apparently work as staircases up and down. But that’s about all I’m able to figure out, so I log out in frustration. As I’m writing up this post, I find out what my mistake apparently was. You pretty much better read player guides to getting started, first. OK then – the first google hit was this Wiki document, telling me that the first time you log in, you get dropped in the middle of the action. Did you like that ? No ? OK, then log out and you will be transported to the base for your faction. So far, this is exactly my experience. From the Wiki, I discover I should look for terminals next. 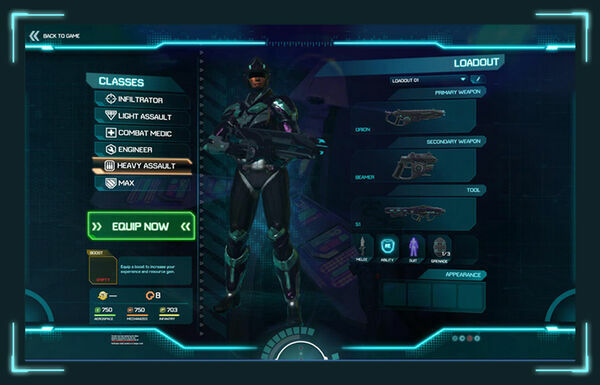 A terminal with a gun, is used for selecting your class. A terminal with a tank, selects a ground vehicle, and an airplane selects an airplane. Practice moving around in a vehicle, before going into combat, is suggested. To go into combat, I apparently look for a map terminal. OK then – now I have an idea what to do when logging in next. I believe I’ll be heading for that first when re-entering the game.